The author examines interconnectivity issues and attributes of transit stops that are important to commuters, operators, and communities connected with public transport. Travel by public transit involves much more than moving about on transit. A typical door-to-door trip entails walking from one’s origin to a bus stop or train station, waiting for one’s vehicle to arrive, boarding the vehicle, travelling in the vehicle, alighting from the vehicle, and then walking to one’s final destination. In many cases, the trip involves transfers; travellers frequently alight from one transit vehicle, move to a new stop or platform, wait for another transit vehicle, and board that vehicle. Transit travellers spend a great deal of time and energy on this out-of-vehicle walking and waiting, which plays greatly into their perceived burden of transit travel. Despite the importance of out-of-vehicle transit travel, the in-vehicle travel experience has tended to garner the lion’s share of attention from transit managers and researchers. The burden of out-of-vehicle segments of transit travel, such as walking, waiting, and transferring should be reduced with the ultimate goal of improving the attractiveness of public transit. As cities have grown more dispersed and auto-oriented, the relative burdens of out-of-vehicle time in transit trips have increased. 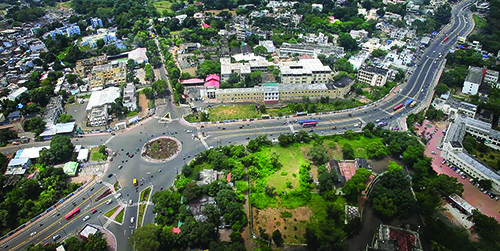 In an effort to accommodate increasingly dispersed patterns of trip-making, many transit systems in Indian metropolitan areas now require transit users to make frequent transfers among lines, modes, and operators. In metropolitan areas with large transit systems, transit stops and stations are central parts of the transit network, playing an important role in connecting multiple transportation systems — both intermodal and intramodal. 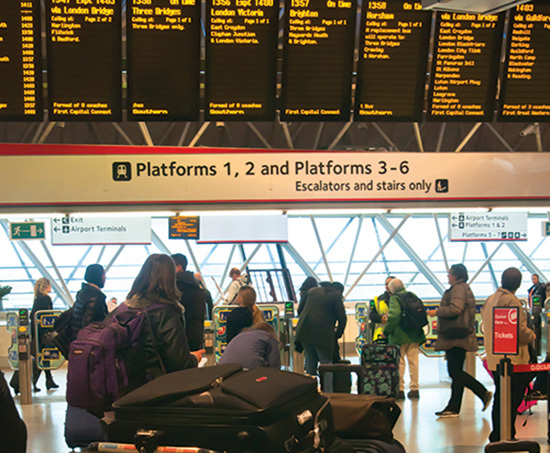 The effectiveness of connectivity influences travellers’ experience at transit stops and stations, and, in turn, their choice of whether or not to take a particular transit trip. Given the importance of out-of- vehicle times on travel choices, good connectivity at such transit stops and stations is a critical part of overall transportation network effectiveness. What are the best ways to reduce these out-of-vehicle travel burdens? Are some approaches to improving the interconnectivity among transit lines, modes, and systems more cost-effective than others? Can improvements be made in a stand-alone fashion, or do they need to be implemented in concert with other improvements? Do different types of transit travellers tend to perceive the burdens of walking, waiting, and transferring differently? To address these questions, a methodology based on travel behaviour has been developed by the author to evaluate the components of the out-of-vehicle travel experience. Such information should help transit planners cost-effectively improve operations at transit stops and stations. Reviewing a large number of studies conducted on the subject of travel behaviour, a study done by the author has developed a transfer penalties framework to relate transit waiting time, walking time, and transfers to people’s generalized cost (or utility) in their transit trips. Based on this framework, the study also suggested a classification of factors relating to out-of-vehicle travel time to examine which part of transfer penalties would likely be affected by various improvements to transit service, stops, and stations. This framework provides a theoretical basis for developing methods to evaluate the connectivity performance of transit stops and stations systematically and meaningfully. This approach is very different from a vast majority of past studies, which have focused heavily on design aspects. In these design-focused studies, most of the suggested improvements have seemed intuitively correct, though the actual effects on travel behaviour remain relatively ambiguous and unexamined. Using this framework, a survey was designed to examine user perceptions of each of these five evaluation criteria. The survey was administered to transit passengers at transit stops. In particular, transit passengers were asked to assess the level of importance of multiple service features, and indicate their level of satisfaction at the stop or station where the survey was administered under the current conditions on a four-point scale from “very important” to “not important”, and “strongly agree” to “strongly disagree”, respectively. 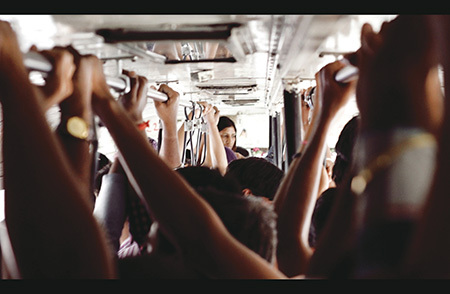 To collect data for this analysis, the author and his team conducted a survey of transit passengers on BRTS Bhopal, asking a series of questions about their experiences at transfer stops and stations. This component of the study helped them to achieve the study’s central goal of developing the means by which transit stakeholders may assess the performance of transit connectivity. 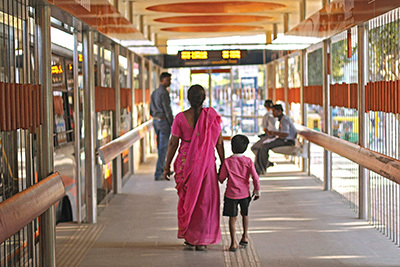 The findings from this study form the basis for the project’s continuing process in identifying and investigating the important factors of transit stops and stations influencing people’s travel behaviour and their contribution to growth in ridership of the BRTS. While many previous studies have investigated the improvements at transit stops and stations, these past studies have, in general, lacked causal clarity of how such improvements can increase transit ridership. Most of these studies were conducted from a design perspective, and suggest improvements at transit stops and stations that are often obvious (e.g. providing more seats and shelters, improving lighting, keeping facilities clean). This lack of clarity or causality is a problem, making it difficult for transit managers to improve the quality of waiting and transfers at transit stops and stations cost-effectively. This study evaluated the waiting and transfer experiences from the passengers’ perspective. Specifically, the study examined: 1) how passengers evaluate transit stops and stations, taking into account the level of importance passengers place on each factors, and 2) what factors influence passengers’ evaluation of transit stops and stations.